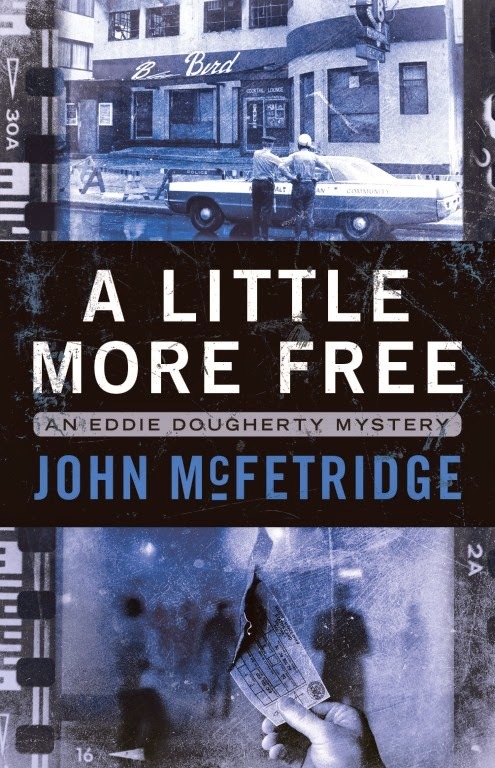 Funny, John McFetridge is a nonfictional character in Declan's Burke's latest novel. I'm looking forward to reading A Little More Free as I really liked the first one. John McFetridge in The Lost and the Blind? I shall have to investigate forthwith. All that meta stuff, of course, started right here. A Little More Free is just terrific, packing any number of momentous events into a small space but at the same time portraying them as people presumably would have experienced them at the time--that is, without the knowledge we know have of those events, and without the accretion of myth they have since gathered. Well, not meta exactly, it's just a passing mention. I received a note from someone both John and I know that she was enjoying the adventures of Rozovsky the photographer in Black Rock. She did not know I became a photographer only after the book appeared. The man can change the world with his pen. Good thing he didn't make Rozovsky a lowdown thief or some other lowlife. Yeah--good thing he's safely stowed away in Canada most of the time too. Oh, I should mention that on my last trip to Montreal, I met up with an old friend I and not seen in many, many years who, it turns out, is friends with the person who was the inspiration for the Rozovsky character. That IS a small world. Or maybe Montreal is just a small town. Of course, I've heard that said about every big city in North America, just as I have heard it said about every big city that, more than most, it's a city of neighborhoods. I could imagine the fictional Rozovsky crossing the border to Plattsburgh or Burlington and getting into further adventures from there. If he's anything like his namesake he might actually turn up anywhere. I actually made that very comment regarding neighborhoods about Washington D.C. just yesterday, although I don't think I said unlike other cities. I wonder why we do it. I suppose it must be because seen from outside cities seem very formidable, but once you get there they break down into manageable parts. I noticed that phenomenon when I moved from Boston, city of neighborhoods, to Philadelphia, city of neighborhoods. Of course, I think our urban culture at large has become more aware be neighborhoods and diversity in recent years. so the phenomenon may not be due entirely to chauvinism. It's interesting that Kramerbooks, which I visited while I was there, had a whole table section of books with titles like Walkable City, and after walking around DC I was very tempted to buy several of them. I think people are getting more interested in getting around cities by bike and by foot than maybe they used to be.